It’s official: precious stones are a great investment, according to one of the UK’s most prominent banking platforms. The Royal Bank of Scotland recently ran an article focusing on the investment potential of gems, featuring contributions from several vintage jewellery brand directors. The firm also sought the expertise of David Sonnenthal, the founder and director of New Bond Street Pawnbrokers, to uncover why precious stones are such a viable investment. The article looks at the different factors to consider before investing in gems, and highlights the fact that in recent years, increasing numbers of diamonds are being sold as investment assets. Part of the reason why it makes sense to invest in precious stones lies in the fact that they are long-lasting. The near-indestructible properties of certain stones and the financial stability in the market means that increasing numbers of hedge funds are considering diversifying their portfolios with gemstones – with some experts pointing to stability as a main concern, particularly in a world of increasing political and social uncertainty. Demand is currently high for the best quality diamonds. These “investment diamonds” are accepted by Rapaport – the world’s leading trading platform for gemstones – only if they meet strict criteria. 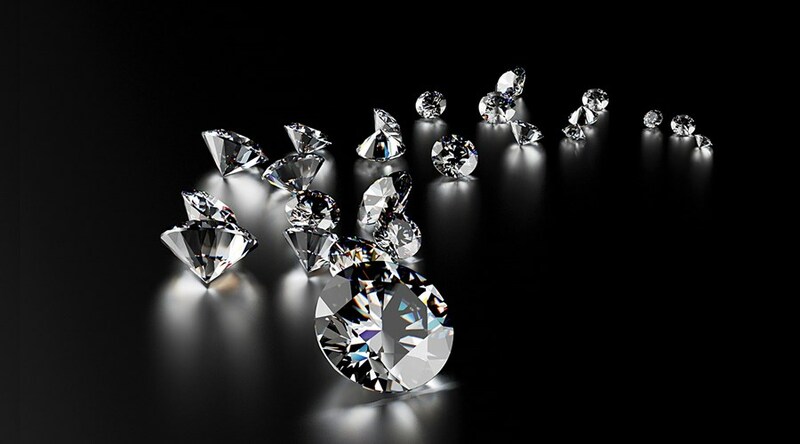 Diamonds must be ranked with a clarity rating of at least VS2 and a colour grade of at least H.
The cut of the diamond is also important when it comes to investment diamonds – each of which must be certified by the Gemological Institute of America before being accepted by the world’s biggest platform for diamond trading. Naturally-coloured diamonds command the best prices. At present, larger, natural diamonds are selling for record-breaking sums at auction – smaller pink diamonds can fetch up to £30,000 per carat, for example. Diamonds treated to appear a certain colour are not quite as valuable, however. It’s an age-old adage, but the crux of the article seems to be: if it looks too good to be true, then it probably is. Diamond investors should be wary of diamonds advertised with a colour in inverted commas – ‘blue’ diamonds for example – as this is typically an indicator that the diamond has been treated. While such items may still be classifiable as natural, they are usually lower in clarity and subsequently irradiated to obtain a more marketable colour. • While prices can and do fluctuate, diamonds will rise in value – provided the purchaser has bought it as close to market price as is possible. • It’s not always possible to get close to market price, but anything between 25% to 30% over current market value still makes for a viable asset. • Brands such as De Beers and Graff are firmly in control of the market, on account of owning some of the best stones on the planet. • Don’t rush into purchases without doing some research. It’s possible to purchase stones with the intention of turning them into finished jewellery pieces for sale at an auction house or retail outlet, and the addition of platinum or gold can even have a positive effect on the price you can command. However, those purchasing stones for investment are advised to keep them loose. To gain more of an insight into the emerging investment diamond market, you can read the original article – complete with expert analysis from David Sonnenthal – by clicking here. For more information on services provided by New Bond Street Pawnbrokers please watch our video here and read about the loan process here.